Train accidents may seem like they can’t happen to you, but they are devastating incidents that often result in serious injury or even death to the passengers involved. Trains can derail, collide with vehicles, have a railroad crossing accident, or an accident involving hazardous materials. Many people can be harmed in these accidents, and if you’ve lived through one, you know they are gruesome. There are many causes of train accidents, including negligent railroad employees, corporations or a government agencies, or equipment manufacturers. In Arizona, a personal injury or wrongful death case stemming from a train accident is often complicated, as your legal team must work to determine the cause of the accident, find out who is legally responsible, and ascertain whether the train was operating under specific laws and statutes of limitations. The Phoenix train accident lawyers at Plattner Verderame, P.C. have the skill and experience to handle these complex cases. Each of these causes of train accidents is due to some form of negligence. Because they are considered common carriers, train operators and the companies which run them must abide by a specific set or rules and regulations when it comes to safety. Thus, trains are typically required to have a “black box” recording device installed within the locomotive. After an accident, important information, such as speed and use of brakes, are stored within the box. Suffering after any accident can be difficult, but train accidents can be especially gruesome and traumatic. With expensive medical bills and the possibility of lost limbs, chronic pain, loss of work time or jobs, and emotional distress, you will need experienced legal representation to help you obtain the justice and compensation you deserve. If a loved one has suffered a wrongful death due to a train accident involving Metro Valley, Amtrak or a scenic railroad excursion like Grand Canyon Railway, we have a compassionate and dedicated team of attorneys to assist you in this turbulent time of need. Our honest, dependable attorneys are also prepared to take on a train accident injury case with multiple plaintiffs. Although these are typically less common, we take pride in our ability to advocate on behalf of injured railroad workers. Even for singular cases, the Federal Employers’ Liability Act (FELA) protects railroad employees and workers that move state-to-state for interstate commerce. Train companies must provide a workplace that is reasonably free from harm, which includes training and adequate supervision of more junior employees. Additionally, FELA mandates that workers must be free from intentional acts of harm, as well as from unreasonable or excessive work quotas. In the case of wrongful death, the employee’s family can obtain compensatory justice, as well. Our firm works with honest clients to gather all of the evidence pertaining to your train accident and conduct a thorough investigation as we help you craft your case. This investigation and its results will be a crucial part of your representation, as will fully documenting the nature and the extent of your injuries. From there, we will work with you and other experts to create financial projections of how such injuries will affect you and your family in the future. 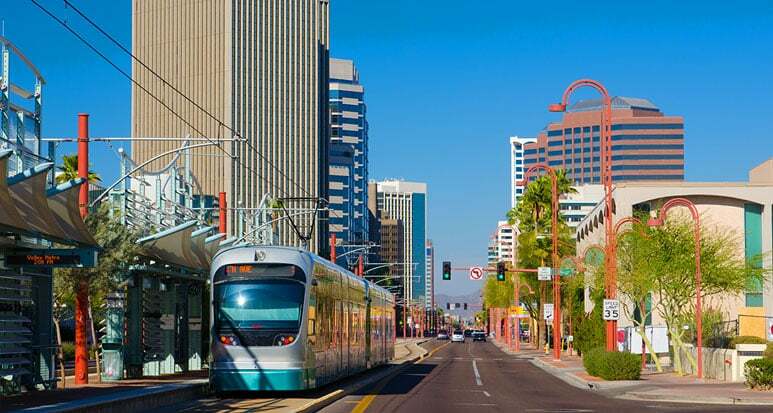 Correctly identifying the responsible parties and advocating for you requires the technical and legal skills and oversight of a dedicated Phoenix train accident attorney. The partners at Plattner Verderame, P.C. are Board Certified by the Arizona Bar Association Board of Legal Specialization as Specialists in Personal Injury and Wrongful Death Litigation, which means we hold ourselves to extremely high standards of advocacy and representation. We have dedicated our lives to providing this top quality representation, and we strive to make it affordable by taking personal injury cases on a contingency-fee basis. You won’t pay a thing unless we obtain justice for you via a settlement or verdict in your case. For a confidential consultation, call us at 602-783-8793, or complete our contact form.